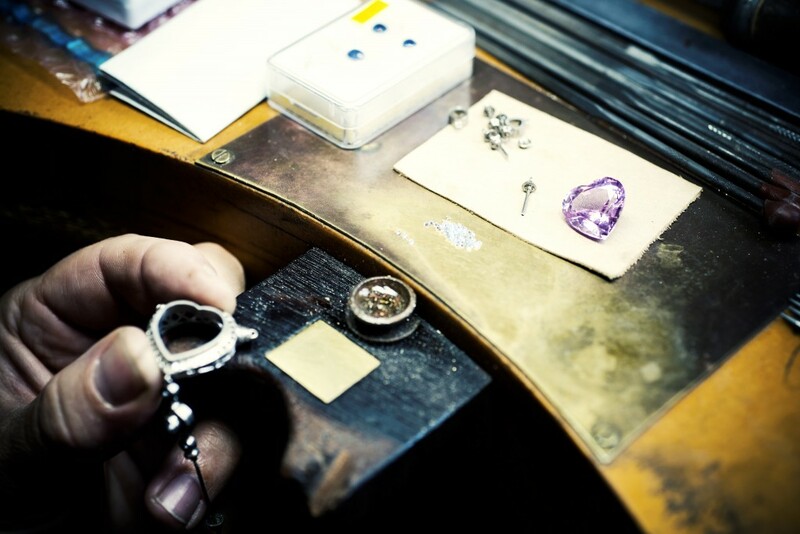 You are at:Home»Jewellery Designers»Theo Fennell, the man behind the magic. 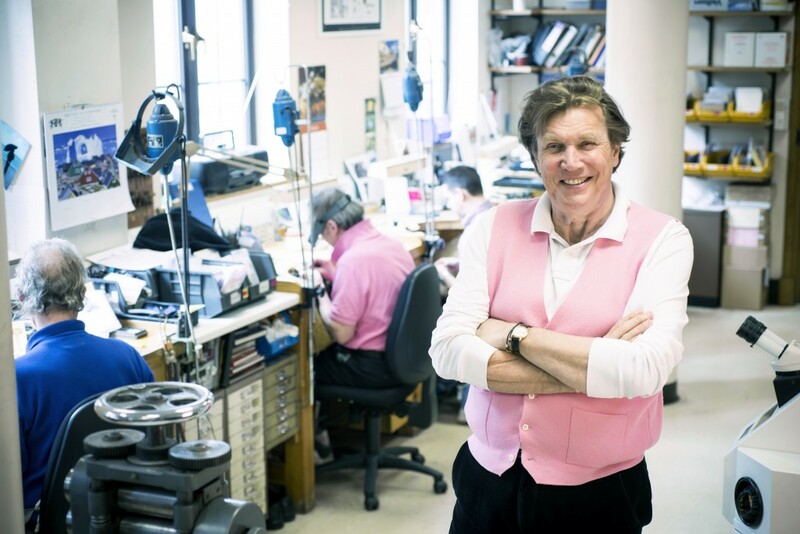 Theo Fennell, the man behind the magic. It was only recently that was I introduced to the work of Theo Fennell. However, I will say that since then I have become an avid fan of his style, his originality and his exceptional attention to detail. This puts him, in my view, amongst the most creative jewellery designers around today. As those who read my blog will be aware, I have already been lucky enough to have had a preview of some of Theo’s latest pieces. However, I was keen to find out more about the brand, the man and the process that takes place in order to create these incredible works of art. 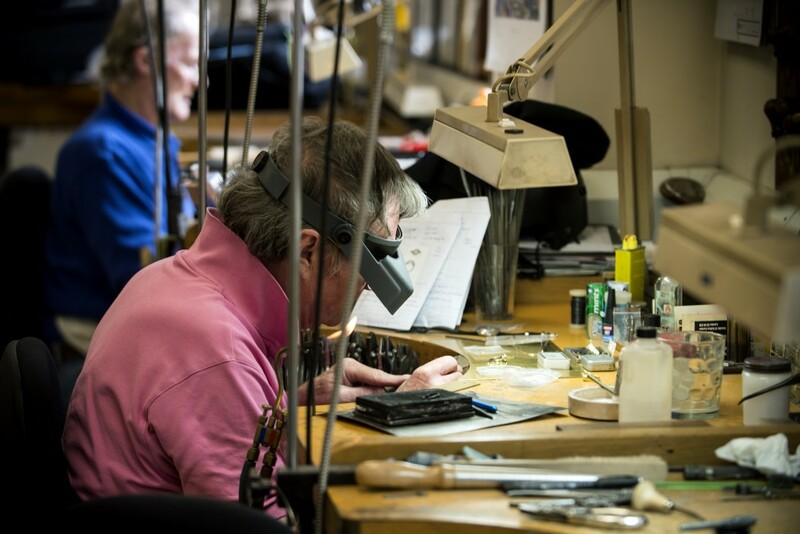 In addition to the great workshop and behind the scenes photographs provided by the Theo Fennell office, I was also fortunate enough to put a few questions to the man himself in the hope of discovering a little more about what makes him tick and how he conceives such fantastic jewellery. 1. What is the creative process for designing and producing a new collection? I sketch wherever I am and normally an idea will rise from a persistently bubbling mass of many ideas and hold water for a bit, and then another comes along until one becomes the outright winner. Sometimes one idea does appear in a flash and storms into my mind and bustles in and takes over. Interaction in the Studio and tangental conversations introduce minds younger and less forgetful than mine and act as catalysts. Occasionally it is a much more pragmatic and cerebral affair and the answer comes from being worked out over many doodles. I never sit down to ‘design a collection’ as we don’t really follow the calendar in that way so it comes about amongst ideas for one-offs, random designs, editions and commissions. Once we are decided we will make prototypes in the workshop next to my studio here in the Fulham Road above the shop and then work on those until perfect then onwards and upwards. 2. How long does the whole process usually take? Literally anything from a week to a month for the gestation of ideas and working drawings and then, from prototype maybe six months to be on sale in our shops. 3. 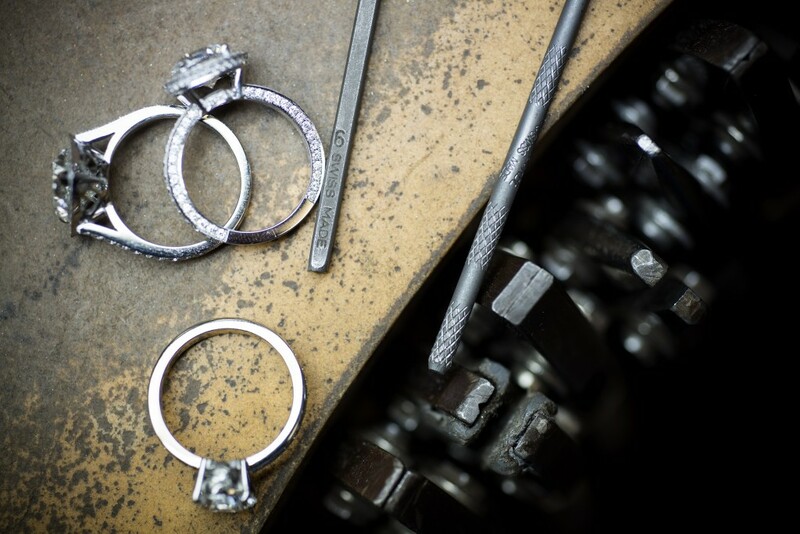 A lot of your jewellery pays homage to the natural world. Which element of nature would you say you have more of an affinity with (e.g. water and aquatic themes / earth themes / fire and sunlight themes etc) and why? Good Lord, I had no idea. I think I am as influenced by the great works of humanity detail and minutiae than I am by huge things, though. 4. Aside from the natural world, what inspires you? Absolutely anything from music and literature to paintings and movies, I keep my eyes and mind open to almost everything and have interests and passions as eclectic as my little brain can cope with. I can be inspired by the smallest detail or a grand concept. I think there is a certain quirkiness instilled from my background that appeals to me. 5. Has there ever been one piece that you designed in your mind and simply had to make? If so, what was it? Always the next one, otherwise why go on? 6. If you were going to the greatest jewellery show on earth and could only showcase one piece, which would it be and why? Nelson’s Order of the Bath if it were not one of my pieces and my wife’s locket if so. 7. What’s next for TF? Are you working on any new collections? I am always working on new ideas and forever looking for new materials and new techniques. I have the best workshop you can imagine here and a fabulous studio team and it is wonderful to see how far my imagination can push them. 8. Sum up your jewellery in 3 words. Original, timeless and joyful. Finally, in addition to the interview I wanted to take a moment to put a spotlight on some more of Theo’s fantastic creations. I have chosen one piece from each themed collection. However, all these pieces actually fall under Theo’s Limited Editions category, meaning that only a limited number of each have ever been created, thus making them extremely desirable. Whilst I am quite new to the brand I am seriously enjoying the voyage of discovery, each piece more inventive, mystical and thought provoking than the last. It is Theo’s ability to tell a story that I think I admire most of all. These pieces, similar to those that I have already reviewed on my blog (arcticrosejewels.blogspot.com), are no different. The choice of stones, metals and intricate design all convey a completely unique message which ties in seamlessly with the name of the collection that it sits under. Limited Edition Magical Dawn Cross Pendant. 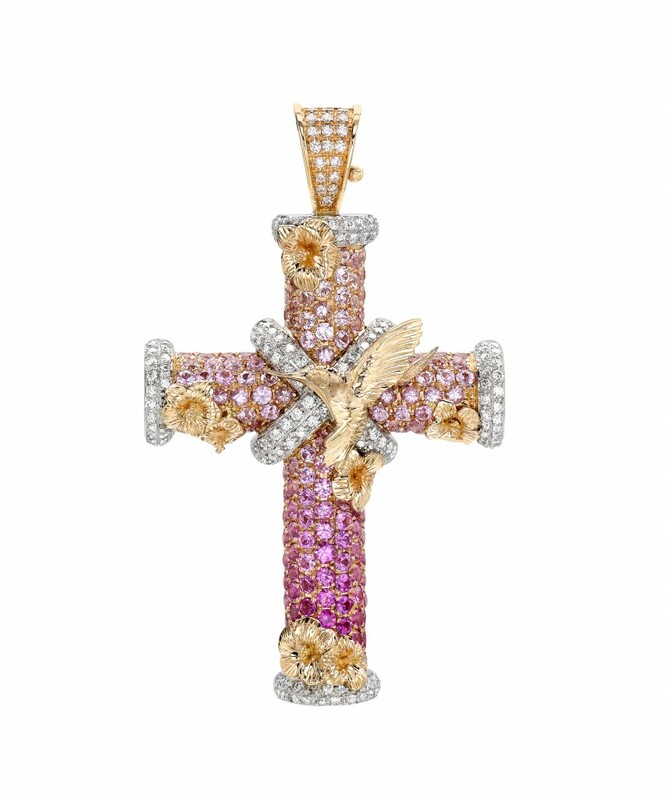 This absolutely stunning cross is crafted from 18ct rose gold and set with graduated pink sapphires and diamonds and retails for £9,500. The stones are then beautifully complimented by delicate and magnificently detailed hummingbirds and blossoms. Only 25 pieces were created, each individually numbered and it is not surprising that this particular piece is currently sold out. I love the colours that have been chosen for this piece. The pinks and rose gold perfectly mimic those colours seen at sunrise and are befitting of the Magical Dawn name. Limited Edition Secret Garden Locket. This striking pendant is another classic example of Theo Fennell’s ability to tell a story simply through a piece of jewellery. The locket is crafted from black diamonds surrounding a 1.58ct citrine stone and is finished with exquisitely detailed gold ivy and bees creating a sharp contrast against the dark and somewhat mysterious background. Quite like finding a secret garden hidden away somewhere. From what I have seen and read, Theo takes a great deal of his inspiration from nature, and the inclusion of bees and flowers is somewhat of a trademark in his work. If you were lucky enough to own this pendant it would surely be something that you would keep and pass on for future generations to appreciate. Limited Edition Enchanted Pool Key Pendant. My final selection is the enchanted pool key pendant. 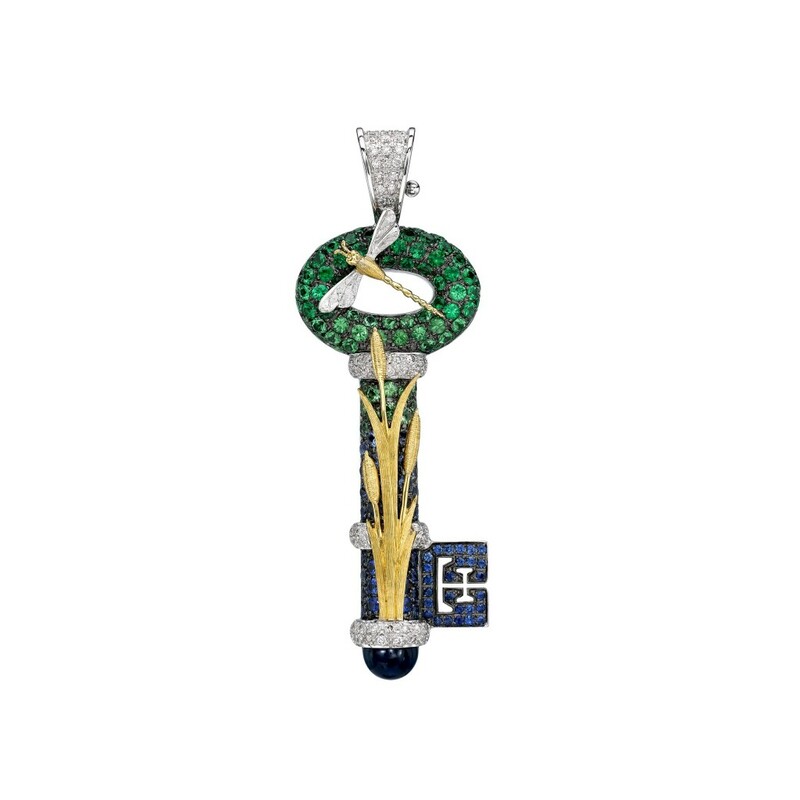 This pendant has been crafted using 18ct white and yellow gold and is set with Tsavorite, Sapphires and Diamonds and retails for £7,950. The beautiful deep green and blue tones of the stones enhances the intricate detail of the dragonfly and rushes, conjuring up images of hidden lakes and ponds, like those described in fairy tales. A truly enchanting piece. It’s nice to read about the process, the inspiration and the man behind the designs.